This is our knitted, poly-based fabric, which, due to its tight construct, stretches significantly more with the weft but still allowing a fair amount with the warp. With its very fine mesh-like build, the crushed velour printing retains opaque quality. Weighing 0.33 lbs, our custom print Crush Velour fabric is quite a light textile, but has volume and retains heat well due to its soft pile. Its unique shiny fabric surface absorbs and reflects light and gives it the sheen and shimmer we love. Printing Crush Velour fabric is really fun. The texture and prints work very well together, complimenting color and handle within the gorgeous plush fabric with rich, striking color. This is a very plush custom fabric, with a sheen to it that makes the fabric look luxurious. It has a super soft front face, and a soft back face which feels delicate and smooth on the skin. It is perfect for wearables as it drapes easily. Various velours have deep piles and are heavy in weight, however our velour fabric is lightweight with a flat finish leaving a smooth face. 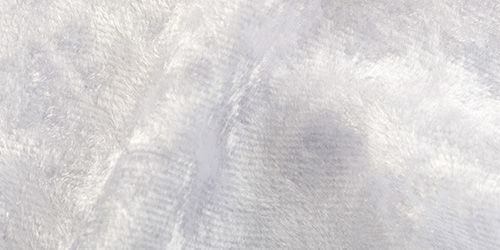 This is a shiny fabric, which, due to its tight mesh-like construct, leaves the fabric with an opacity that is clear when light is allowed to pass through. With a shimmery white base, the colors of the print stand out bold and glistening on top of the fabric pile when catching the light. Prints well with deep and vibrant color. Due to its light weight, in comparison to velvet, this material is perfect for clothing, such as dresses and soft linings and ideal for luxurious and glamorous robes. 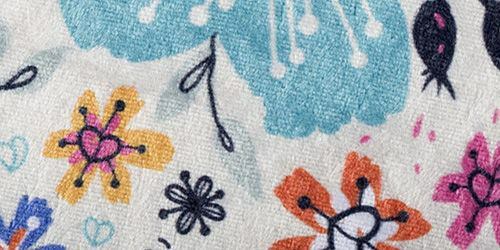 This custom printed fabric also works well for soft trimmings and furnishings. lovely! excellent quality; better and faster than expected! fantastic quality organic cotton poplin of high quality was exactly as the samples and printed with the perfect precision and detail that was requested and exactly like the image uploaded. What is the difference between Crush Velour and Velvet? We have a Velvet Shimmer option or a Plush Velvet as our resident velvet fabrics. They are both more structured than the Crushed Velour which is super stretchy, but not at all stiff. Each has its own properties of merit, depending on what you want to use it for. We suggest ordering the swatch pack or get some test prints of both. Will the print come out well? Yes indeed, very well. The crush velour does have a great texture to it with its brushed face, but this does not interrupt the print at all. Only when the fabric is stretched beyond the normal amount will the image start to get distorted. If you make the fabric to the right size to avoid too much stretching, you should have no problems with your print. Can I use the Crush Velour for upholstery? The Crush Velour has a very high stretch to it, which makes it a difficult one to guarantee good results when using for large furniture. If you add a backing fabric, it will be more durable, but with the combined stretch and plush structure the results are risky as it is not a tough fabric. We would recommend our tough and strong Velvet Shimmer for similar effect but with a supported back for durability.